"The Return Of THE CROWN" is written on the cover, which might be a little bit confusing, because the band never has dissappeared. 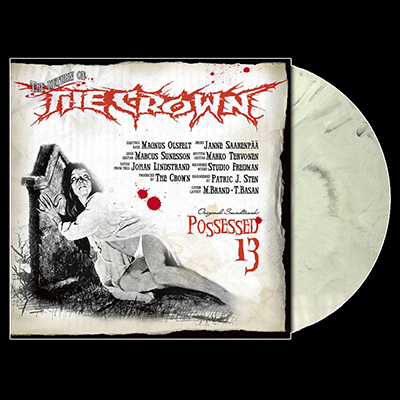 Nevertheless "Possessed 13" is some kind of return, a return to complex, variable songwriting, because singer Johan Lindstrand joined the band again to complete the "Royal Five". "Possessed 13" is a perfect follow-up of their previous releases "Deathrace King" and "Hell Is Here", the speed and the technical direction of "Crowned In Terror" is more or less gone, variety and atmosphere are more important on the "new" album. The sixth album of this scandinavian band offers a little bit of everything THE CROWN is know for: Old School Death Metal, furious Thrash Metal, dirty Rock ´N´Roll merged together in unique, engrossing songs. Definitely a must in every Extreme Metal vinyl collection. In the year 2003 METAL BLADE RECORDS, USA did the first issue of this album. Limited edition of 200 hand-numbered copies on Cool Grey Marbled vinyl, this album comes with lyric insert and double-sided poster. This re-issue is strictly limited and available in different colours, all songs got a special mastering for vinyl.